For many, the quest for the real England is also a quest for their real selves. It’s a search to break away from the overpopulated and the manufactured. It’s a chance to come face to face with the undiluted and the organic. They hope to catch a glimpse of something that, until now, has always been just beyond their grasp. This search has never been easier with England’s Great West Way. There are many reasons to love this 125-mile path spanning from Bristol to London, and we’ve narrowed it down to our top eight. The Great West Way gives you the chance to see a number of places designated as notable by the United Nations Educational Scientific and Cultural Organization (UNESCO). 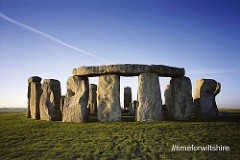 You’ll explore the mysteries of Stonehenge and Avebury Stone Circle. How did they get there? And just what was their purpose? 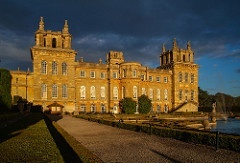 You’ll take in the history of Blenheim Palace where Winston Churchill was born and the English elite were often entertained. You’ll marvel at the sheer beauty of the Royal Botanic Gardens Kew with the largest Victorian glasshouse in the world. You’ll set foot in Bath – a city that earned a UNESCO title all on its own. What stories are waiting to be told in the land of Jane Austen, the Roman Baths and the Royal Crescent? And, of course, you can’t miss the Tower of London. This iconic site is known for its rich history and grim tales. Keep your eye out for a ghost or two peering through its ominous windows. No matter your mode of transportation, the Great West Way has you covered for it’s 125-mile path. Maybe you’ll hop in your car and set off on one of the oldest highways, as well as the world’s first mail route for automobiles. Perhaps you’ll take the train from London Paddington Station; making stops at the curious and the enchanting, as you head all the way to Bristol. 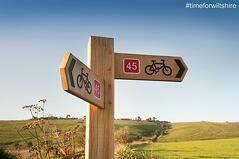 Or you might find yourself cycling the Great West Way’s picturesque paths as you discover ‘must-see’s and hidden gems. Either way, you’ll find everything you’re looking for and then some. The cultural hubs of London and Bristol act as bookends of the Great West Way. 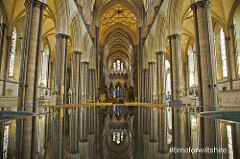 Just as magnificent, Bath is located in the middle of this route. 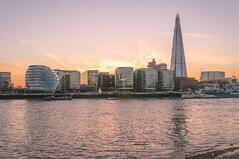 With London, you’ll get a taste of traditional England and many of its top attractions. A stop in this city is a great opportunity to check off many sites on your UK bucket list. Bath provides a unique escape into a world where the past meets the present. The cobblestone paths and ancient waters have seen a lot and have much to share. To the west, Bristol is a contemporary jewel. Go below deck on the SS Great Britain or set foot in the Fleet Air Arm Museum and see for yourself. The Great West Way excites with its cities and delights with its villages. You’ll fall in love with the idyllic cottages of places like Clench Common. The charm of spots like Maningford Bruce will be tough to ignore. History will beckon you from villages like Netheravon and Larkhill. 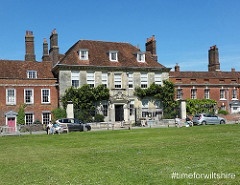 No matter where you find you find yourself, the Great West Way villages will remind you some of the best adventures occur off the beaten track. You’ll be hard-pressed to find views better than those of the Great West Way. 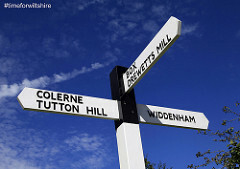 This is a route highlighting everything from the idyllic Cotswolds to the stoic River Thames. The Clifton Suspension Bridge’s scenery offers much more than just the connecting of land between water, yet asks for nothing in return. The sun’s rise and set over Stonehenge will intrigue the mind and mystify the senses. 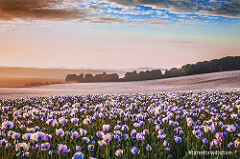 Seemingly endless country fields will show you you’re not just at the Great West way – you’re at peace. There’s so much to see and do along the Great West Way. In fact, you’re never more than 10 minutes away from a point of interest. This is not one of those journeys where you visit something and get back in the car for 2 hours before another attraction is nearby. The Great West Way has it all – from big cities to quaint villages, from modern marvels to ancient sites, from the forests and rivers to castles and manors. Whether you seek top attractions, hidden gems, or a bit of both – the ‘must-see’ and the undiscovered are all ready and waiting. Who needs textbooks when the Magna Carta is in the next town over? Why watch ‘The Royals’ when you can visit Windsor Castle for yourself - the oldest and largest inhabited of its kind? How about skipping that cruise and exploring ‘The Ship That Changed the World’? To top it off, what if you got to all of these places by driving on one of the first great roads commissioned by the King of England? That’s just a small example of countless other historical things to see and do along the Great West Way. Neither the history buff nor the even remotely curious traveler will be disappointed on this route where the past comes to life and the present becomes adventure. The best way to capture the essence of England is to stare it right in the face. The Great West Way is the perfect alternative to cookie-cutter vacations and overpopulated tourist attractions. This is 125 miles of the raw, real England. You’ll find it in every step you take from Bristol to London. It waits in the quiet corners of open fields and villages. It beckons from the bustling icons of cultural hubs and cities. The stories of those who came before and the happenings of times past are alive and well. They merely wait to speak with those who’ll listen. At some point between chatting with friendly locals and gazing at the waving Union Jack, it will hit you: The Great West Way is many things, but above all, it is quintessentially English.